Larger than most true parrots, these birds have quite an appearance and voice. What they lack in the colorful plumage of many parrots, they make up for with their expressive crests and loud, screaming shrieks. Their common name cockatoo comes from the Malay word kakatua, which roughly translates into older sister. 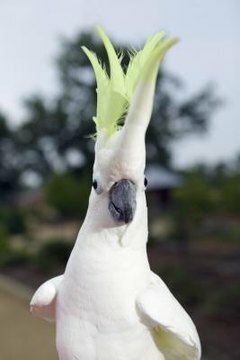 Cockatoos belong to the same scientific order and family as the true parrots, Psittaciformes and Psittacidae, respectively. They are, however, separated into their own subfamily, Cacatuinae. They share many features with the true parrots and they themselves are referred to as parrots on occasion. Similar features include the familiar curved beak and their zygodactyl feet, meaning they have two toes on the front of their feet and two toes on the back of each foot. Unlike true parrots which are found throughout tropical and subtropical regions of the world, the 21 species of cockatoo are restricted to Australia and a few of the surrounding islands such as New Guinea and Indonesia. According to Windaroo Zoo, 11 species occur only in Australia while the other ten occur either in both Australia and the nearby islands or just the nearby islands. Cockatoos prefer to live in forested areas of various types including rainforests and scrublands. Most species prefer to roost and nest in taller trees and some even keep a few potential nesting trees within their protected territories. In their native land, some species can become pests as they attack wood decks and siding, or damage ornamental trees. (See Ref 2-4, economic importance for humans; Ref 5, bottom of 1st paragraph) The pet trade has severely damaged the populations of a few species. One of the differences between cockatoos and the true parrots is the lack of colors such as the bright greens, blues and reds found in macaws and other species. Most cockatoos are black or white. Non-white species include the deep black palm cockatoo with its rosy cheeks and Major Mitchell's cockatoo which exhibits salmon to deep pink hues. Most of the species found in the pet trade are one of the white varieties, including the sulphur-crested cockatoo with its yellow crest and underside of its tail, umbrella cockatoos and white cockatoos.